Pasupathy Radhakrishnan (40), married with 3 children, is a carpenter by profession. 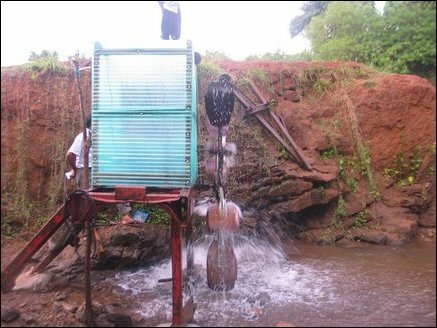 His model hydro generator has significant utility value and organizations are showing interest in expanding the deployment to other villages. Even smaller scale systems called pico-hydros are also used in Latin American countries. 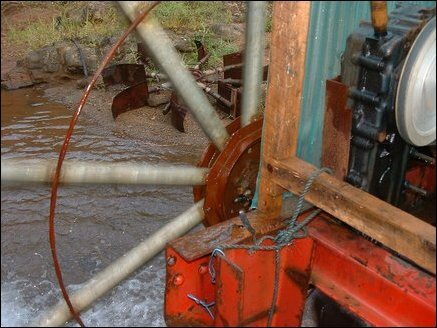 A view from behind the "turbine wheel" and the generator/gear-box housing which stand on a cast-iron welded structure. Welds for the structure and turbine spokes constructed to withstand the 24-hour operation. Additional improvements are contemplated to reduce vibration and increase stability. Automatic power control is also being contemplated for the next phase. Side view of the plant. The turbine, gear box and the alternator assembly. The earlier version of the turbine wheel lies in the background. 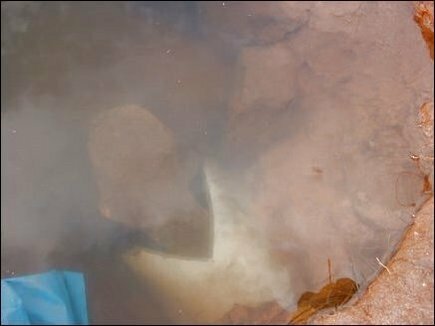 View from the top of one of the pipes feeding water to the turbine through a 7-8 feet drop. The second pipe is used for generating additional power. 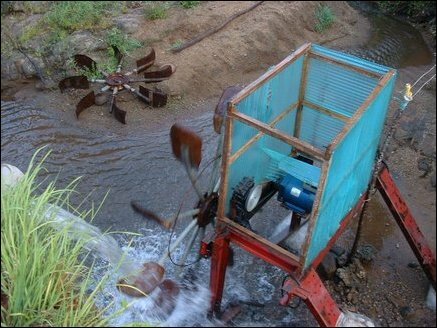 Properly positioned stones at the pipe inlet controls the water flow to the turbine and hence controls the power produced. 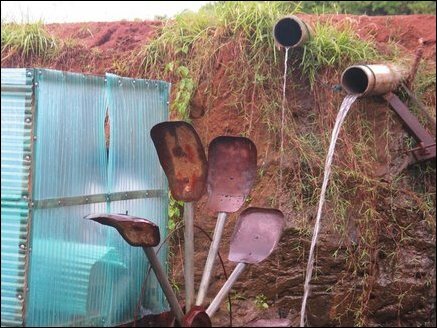 Water release for the mini-tank that feeds the micro-hydro plant. 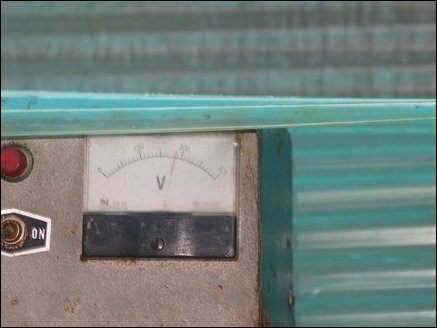 Volt meter located at the generator site showing 200V during a demonstration. 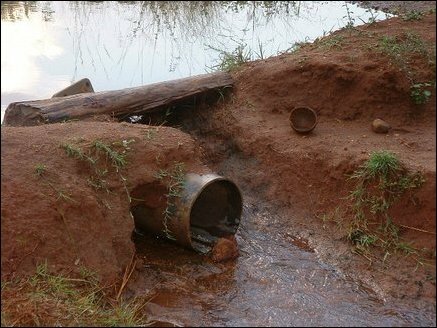 When supplying power the volume of water flow is adjusted at the pipe inlet for the generator to produce the right amount of "power." The crude voltage control technique used requires generating voltage to be near 250V for the homes to receive the right range of voltage. The gear-box is from a two-wheel tractor (Landmaster) common in Vanni. Set at the high gear-ratio, the equipment requires maintenance, lubrication etc for trouble free operation of the plant. 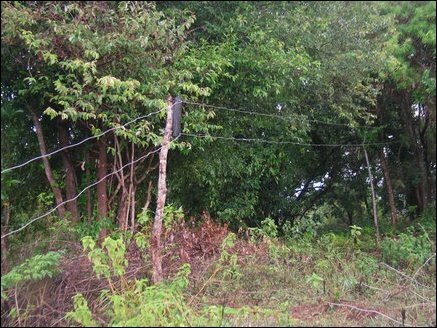 Transmission system with home made poles and insulators made of plastic. The system carried AC power to twelve homes and a temple. The transmission lines carried AC power to more than a mile. Radhakrishnan explaining how he improved his construction from his initial attempts at using a fixed magnet alternator to the more sophisticated 3KVA generator. 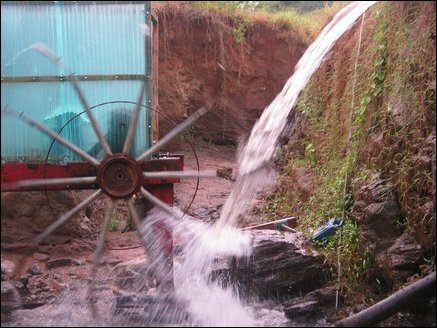 Pelton wheel (large water head), Francis turbine (medium water head) and Kaplan turbine (low water head) have characteristic blade curvatures for maximum efficiency. Radhakrishnan figured out by experimentation the optimum blade configuration for his model hydro. 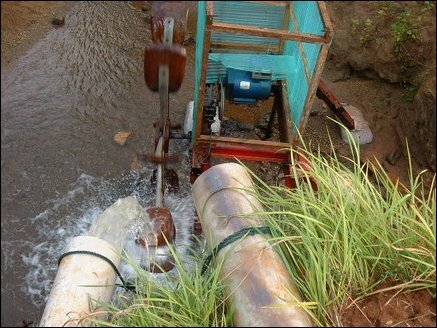 The whole generator unit is located 7-8 feet below the local tank that is fed by water from the Muttaiyankattu irrigation tank. 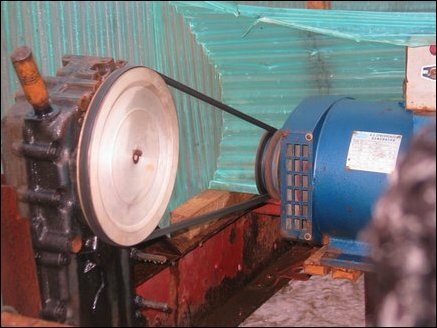 Older generation permanent magnet AC generator used in his first attempt at power generation. Transmission post that provide parallel feeds to multiple transmission lines. Insulators protect the lines from shorting to ground. Overload protector switches and a Voltage regulator which serve as the gateway to the supply network are mounted inside his hut. 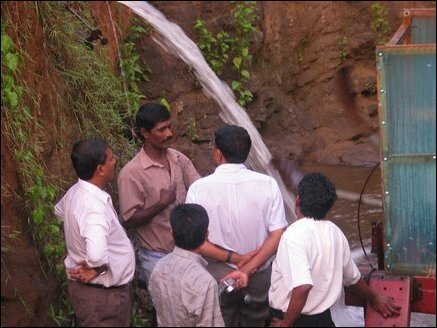 Since power output is manually controlled Radhakrishnan estimates the power need and sets the water flow to the 'desired' level so that the voltage stabilizer is given sufficient range to operate. 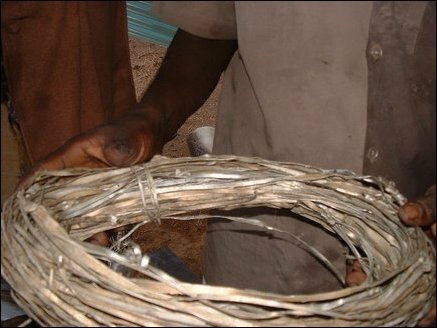 During early phases of his model electrical wires were made from cut metal stripes. Vijayarani Radhakrishnan is supportive of her husband's forays into experimental gadget building. 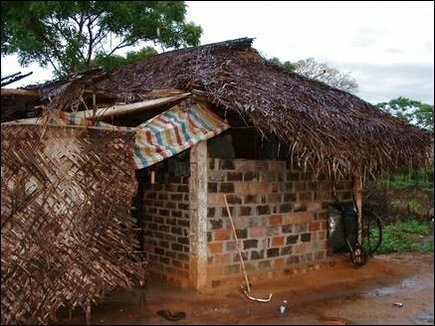 Temporary housing built on land owned by Water Authority by the displaced Radhakrishnan family from Nedunthivu.